Oh Foley, why are you wearing that? I'm sure you'll have pawfect reception. Hope you don't have to wear that for long. wahahahaha...Ops...sorry I couldn't stop laughing it. But why exactly you have to wear it?? Glad to see you're working for the gran... ahem, Grammie! I'm sure her reception will be so much better now. Where'd you find that thing anyway and who helped you put it on? By the way, did Moco ever go out to romp with Bambi? I'm totally curious. Hey you are doin' a great job. Keep up the good work. pee ess..do you get BBC America with that? We can't find it here on our cable and we have an extra collar we could try. 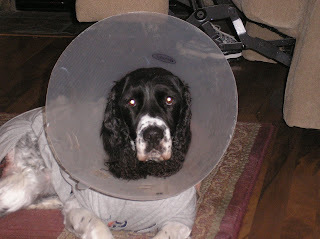 Aw, Folly, I think that satellite dish (or is it a lamp shade?) looks very stylin' on ya! Moco, thanks for droppin' by my blog, I missed ya! It's grrrrEAT to be back. Foley, you are the best dish I ever saw, well apart from a dish containing meat and potatoes of course. 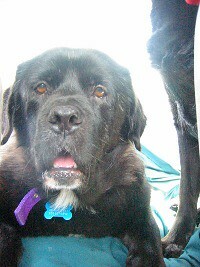 w00f's Pups, ooo me sorry u iz having to ware that..
Foley you know they delayed the change over right? What is that around your neck? Callie had to wear one of those when she got her girl zipper..
Ooooh. Do you get HBO? Could you teach us some new HBO words? I hope you have tuned in to Animal Planet! Khould you beam in MANGO Minster 2009? Is that an old picture or you are actually wearing it now?? I am sure Eduardo is proud of you! Oh no! We hope you don't have to wear that nasty lampshade for long, Foley! Oh, Foley, woo are furry funny!!! Hope woo can help with those transmissions - lots of humans will be needing them. LOL I am sure there are lots of folks out there that still need help with the digital transition. Maybe you can go door to door?? Great work for Eduardo! But why you need to use that?? Uh oh Foley, are you scratching a boo boo? You look better than the dish on our house. BOL! What did you do? I can't believe you're sitting there so calmly, letting Grammie take your picture with that funny thing around your head, Foley! You have the cutest looking Antena available. Perhaps it works better than the cables. Get mom to try it out. What's up with that cone?